A power nap is a short sleep that terminates before deep sleep (slow-wave sleep (SWS)); it is intended to quickly revitalize the subject. Cornell University social psychologist James Maas coined the term. The power nap is meant to maximize the benefits of sleep versus time. It is used to supplement normal sleep, especially when a sleeper has accumulated a sleep deficit. Various durations are recommended for power naps, which are very short compared to regular sleep. The short duration of a power nap is designed to prevent nappers from entering SWS. Depending on duration and intensity, awakenings out of SWS results in sleep inertia, a phenomenon associated with grogginess, disorientation, and even more fatigue than prior to napping. Since sleep is the most effective and beneficial recovery method from fatigue, experts recommend considering duration vs. risk of entering SWS. Power naps restore alertness, performance, and learning ability. A nap may also reverse the hormonal impact of a night of poor sleep or reverse the damage of sleep deprivation. A University of Düsseldorf study found superior memory recall once a person had reached 6 minutes of sleep, suggesting that the onset of sleep may initiate active memory processes of consolidation which—once triggered—remains effective even if sleep is terminated. According to clinical studies among men and women, power nappers of any frequency or duration had a significantly lower coronary mortality ratio (MR) than those not napping. Specifically, those occasionally napping had a 12% lower coronary mortality, whereas those systematically napping had a 37% lower coronary mortality. A Flinders University study of individuals restricted to only five hours of sleep per night found a 10-minute nap was overall the most recuperative nap duration of various nap lengths they examined (lengths of 0 min, 5 min, 10 min, 20 min, and 30 minutes): the 5-minute nap produced few benefits in comparison with the no-nap control; the 10-minute nap produced immediate improvements in all outcome measures (including sleep latency, subjective sleepiness, fatigue, vigor, and cognitive performance), with some of these benefits maintained for as long as 155 minutes; the 20-minute nap was associated with improvements emerging 35 minutes after napping and lasting up to 125 minutes after napping; and the 30-minute nap produced a period of impaired alertness and performance immediately after napping, indicative of sleep inertia, followed by improvements lasting up to 155 minutes after the nap. The NASA Ames Fatigue Countermeasures Group studied the effects of sleep loss and jet lag, and conducts training to counter these effects. A major fatigue countermeasures recommendation consists of a 40-minute nap ("NASA nap") which empirically showed to improve flight crew performance and alertness with a 22% statistical risk of entering SWS. For several years, scientists have been investigating the benefits of napping, both the power nap and much longer sleep durations as long as 1–2 hours. Performance across a wide range of cognitive processes has been tested. Studies demonstrate that naps are as good as a night of sleep for some types of memory tasks. A NASA study led by David F. Dinges, professor at the University of Pennsylvania School of Medicine, found that naps can improve certain memory functions. In that NASA study, volunteers spent several days living on one of 18 different sleep schedules, all in a laboratory setting. To measure the effectiveness of the naps, tests probing memory, alertness, response time, and other cognitive skills were used. Power Napping Enablers and sleep timers allow properly timed power napping. The National Institute of Mental Health funded a team of doctors, led by Alan Hobson, MD, Robert Stickgold, PhD, and colleagues at Harvard University for a study which showed that a midday snooze reverses information overload. Reporting in Nature Neuroscience, Sara Mednick, PhD, Stickgold and colleagues also demonstrated that "burnout" irritation, frustration and poorer performance on a mental task can set in as a day of training wears on. This study also proved that, in some cases, napping could even boost performance to an individual's top levels. The NIMH team wrote: "The bottom line is: we should stop feeling guilty about taking that 'power nap' at work." Sara Mednick conducted a study experimenting on the effects of napping, caffeine, and a placebo. Her results showed that a 60–90-minute nap is more effective than caffeine in memory and cognition. A coffee nap is drinking a cup of coffee before a short 15-minute nap. A brief period of sleep of around 15 to 20 minutes, preceded by consuming a caffeinated drink or another stimulant, may[qualify evidence] combat daytime drowsiness more effectively than napping or drinking coffee alone. A stimulant nap (or coffee nap, caffeine nap, occasionally napuccino) was discovered by British researchers, Horne and Reyner, to be more effective than regular naps in improving post-nap alertness and cognitive functioning. In a driving simulator and a series of studies, Horne and Reyner investigated the effects of cold air, radio, a break with no nap, a nap, caffeine pill vs. placebo and a short nap preceded by caffeine on mildly sleep-deprived subjects. A nap with caffeine was by far the most effective in reducing driving accidents and subjective sleepiness as it helps the body get rid of the sleep-inducing chemical compound adenosine. Caffeine in coffee takes up to half an hour to have an alerting effect, hence "a short (<15min) nap will not be compromised if it is taken immediately after the coffee." One account suggested that it was like a "double shot of energy" from the stimulating boost from caffeine plus better alertness from napping. This procedure has been studied on sleep-deprived humans given the task of driving a motor vehicle afterwards, although it has not been studied on elderly populations. Some companies have nap rooms to allow employees to take a power nap. This may be in a form of a nap room with a recliner, or chairs specially designed for power napping installed in a designated area. Companies with nap rooms claim that employees are happier and become more productive at work. Similar nap rooms and stations also exist in higher education institutions. 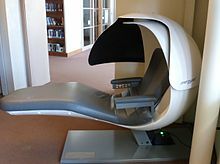 Many colleges and universities provide napping furnitures such as cots and giant bean bags in libraries for students to take a nap after a long study. At least one university[which?] has a nap room set up in a gym. Some medical schools also set up nap rooms at the teaching hospitals. The nap rooms may include sleeping pods or cots, white noise machines, and antimicrobial pillows. A more portable aid is nap timer apps. Apps like Pillow (iOS), lemmenap (iOS), Pzizz (Android, iOS) and Power Nap App (iOS) have various features including aided sounds, nap history and pattern tracking and daily reminders that make it easier to take naps. ^ McEvoy, RD; Lack, LL (2006). "Medical staff working the night shift: Can naps help?". The Medical Journal of Australia. 185 (7): 349–50. PMID 17014398. ^ Dhand, Rajiv; Sohal, Harjyot (2007). "Good sleep, bad sleep! The role of daytime naps in healthy adults". Current Opinion in Internal Medicine. 6: 91. doi:10.1097/01.mcp.0000245703.92311.d0. ^ a b Lahl, Olaf; Wispel, Christiane; Willigens, Bernadette; Pietrowsky, Reinhard (2008). "An ultra short episode of sleep is sufficient to promote declarative memory performance". Journal of Sleep Research. 17 (1): 3–10. doi:10.1111/j.1365-2869.2008.00622.x. PMID 18275549. ^ "Napping may be able to reverse the damage of sleep deprivation". sciencealert. Retrieved 10 February 2015. ^ Naska, Androniki (2007-02-12). "Siesta in Healthy Adults and Coronary Mortality in the General Population". Archives of Internal Medicine. 167 (3): 296–301. doi:10.1001/archinte.167.3.296. ISSN 0003-9926. PMID 17296887. ^ Brooks, A; Lack, L (2006). "A brief afternoon nap following nocturnal sleep restriction: Which nap duration is most recuperative?". Sleep. 29 (6): 831–40. PMID 16796222. ^ a b "NASA: Alertness Management: Strategic Naps in Operational Settings". 1995. Archived from the original on 2012-04-19. Retrieved 2012-04-16. ^ Mollicone, Daniel J.; Van Dongen, Hans P.A. ; Dinges, David F. (2007). "Optimizing sleep/wake schedules in space: Sleep during chronic nocturnal sleep restriction with and without diurnal naps". Acta Astronautica. 60 (4–7): 354. doi:10.1016/j.actaastro.2006.09.022. ^ "The National Institute of Mental Health Power Nap Study". 2002-07-01. Archived from the original on 2002-08-02. Retrieved 2002-07-01. ^ Mednick, S. C. et al. (2008). Comparing the benefits of caffeine, naps, and placebo on verbal, motor and perceptual memory. Behavioural Brain Research. 193: 79-86. ^ The Editors of Prevention, Prevention magazine, 6 Good Health Habits Made Better, Retrieved Aug. 29, 2014, "...1. Take a "caffeine nap"..."
^ An Unashamed Defense of Coffee, Authors: Roseane M. Santos, Roseane M. Santos, M.Sc., Ph.D. & Darcy R. Lima, M.D., Ph.D., Darcy R. Lima, Xlibris Corporation publishers, 2009, , Retrieved Aug. 29, 2014, (see page 66), "...researchers found worked best was a Caffeine Nap..."
^ Rose Eveleth, Smithsonian magazine, OCTOBER 24, 2013, What Is the Exactly Perfect Time to Drink Your Coffee? 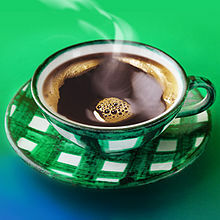 It's a good thing that science is here to figure out the exact perfect way to drink a cup of coffee, Retrieved Aug. 29, 2014, "...taking a 15 minute (no longer) nap right after you chug your coffee..."
^ Corrie Pikul, 02/27/2012, Oprah magazine, 6 More Health Myths—Busted!, Retrieved Aug. 29, 2014, "...Drinking a cup of coffee and then immediately snoozing for 15 minutes was more effective at reviving a wiped-out person.."
^ Reyner, LA; Horne, JA (1998). "Evaluation 'in-car' countermeasures to sleepiness: Cold air and radio". Sleep. 21 (1): 46–50. PMID 9485532. ^ Horne, J. A.; Reyner, L. A. (1995). "Driver sleepiness". Journal of Sleep Research. 4 (S2): 23–29. doi:10.1111/j.1365-2869.1995.tb00222.x. PMID 10607207. ^ "Loughborough University researchers issue new warning to tired drivers". Retrieved 2007-09-23. ^ Reyner, L. A; Horne, J. A (1997). "Suppression of sleepiness in drivers: Combination of caffeine with a short nap". Psychophysiology. 34 (6): 721–5. PMID 9401427. ^ Wan, J; Lau, E; Lee, T (2013). "The effect of caffeine nap on declarative and procedural memory in elderly". Sleep Medicine. 14: e309. doi:10.1016/j.sleep.2013.11.758. ^ Schwartz, Meredith (24 October 2012). "Napping in the Library—On Purpose". Library Journal. Retrieved 24 February 2015. ^ Stump, Scott (15 March 2013). "'Nap rooms' encourage sleeping on the job to boost productivity". TODAY Money. Retrieved 23 February 2015. ^ Waxman, Olivia B. (29 August 2014). "Napping Around: Colleges Provide Campus Snooze Rooms". TIME. Retrieved 23 February 2015. Fox News article: "Researchers: Power Nap Better than Caffeine to Fight Afternoon Fatigue"